Atheism: Belief in no God, or no belief in God. to Atheism, maintained by American Atheists. Anon: "Almost every American denies the existence of Artemis, Baal, Cybele, Fergus, Thor, Wotan, Zeus, and thousands of other gods and goddesses. The difference between a Christian and an Atheist is that an Atheist either actively denies the existence of the Trinity or has no belief in the Trinity. The difference is truly insignificant. It is only one deity among many thousands." Doug Jesseph: "You're allowed to believe in a god. You're allowed to believe unicorns live in your shoes for all I care. But the day you start telling me how to wear my shoes so I don't upset the unicorns, I have a problem with you. The day you start involving the unicorns in making decisions for this country, I have a BIG problem with you." Stephen Roberts: "I contend that we are both atheists. I just believe in one fewer god than you do. When you understand why you dismiss all the other possible [thousands of] gods who people have worshipped], you will understand why I dismiss yours." Scott Adams: "Ask a deeply religious Christian if he'd rather live next to a bearded Muslim that may or may not be plotting a terror attack, or an atheist that may or may not show him how to set up a wireless network in his house. On the scale of prejudice, atheists don't seem so bad lately." Woody Allen (attributed): "To you, I'm an atheist; to God, I'm the Loyal Opposition"
Anon: "If all the Atheists left the U.S., it would lose 93% of the membership of the National Academy of Sciences, but less than 1% of the prison population." Webmaster's note: To put things in perspective, the U.S. would also lose about 25% of its population. Anon: "If there were proof that a god exists, you wouldn't believe it, you'd have knowledge of it. You wouldn't need faith, you'd have facts. What you have is a story that you want to believe. That's it." Isaac Asimov (1920-1992), from the article "On Religiosity" in Free Inquiry magazine: "Although the time of death is approaching me, I am not afraid of dying and going to Hell or (what would be considerably worse) going to the popularized version of Heaven. I expect death to be nothingness and, for removing me from all possible fears of death, I am thankful to atheism." 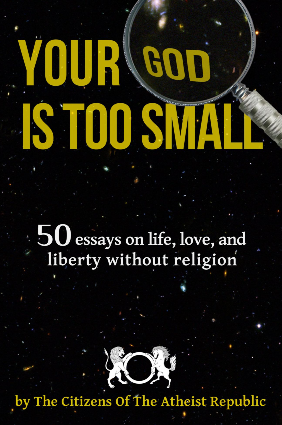 Dan Barker, Author of "Losing Faith in Faith:" "I have something to say to the religionist who feels atheists never say anything positive: You are an intelligent human being. Your life is valuable for its own sake. You are not second-class in the universe, deriving meaning and purpose from some other mind. You are not inherently evil -- you are inherently human, possessing the positive rational potential to help make this a world of morality, peace and joy. Trust yourself." Annie Wood Besant: "No philosophy, no religion, has ever brought so glad a message to the world as this good news of Atheism." H. Havelock Ellis: "And it is in his own image, let us remember, that Man creates God." Guy P. Harrison: "...atheism is not a conscious act of turning away from all gods. It is simply the final destination for those who think. ...you will be pleased to discover that the sky does not fall down on your head. ... if you still want to pray, you can (the success rate of your prayers is unlikely to change)." Alan Harvey: "The 9/11 hijackers are in hell; the victims in heaven! Unless you agree with Al Qaeda, in which case the hijackers are in heaven and the victims in hell. Unless you're an atheist, in which case all of them are simply dead victims of stupidity." Most Atheists assert that they simply lack any belief in God. 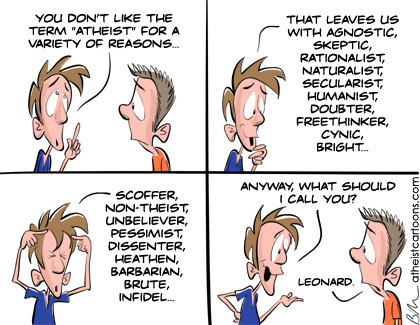 Sometimes, the term "strong Atheist" is used by those who assert that no deity exists. "Henotheist" a person who believes in one main deity and a group of sub-deities. "... any specific system of belief about deity, often involving rituals, a code of ethics, a philosophy of life, and a worldview." Atheism is not a complete religion in the sense that Christianity, Islam, and Judaism are. Atheism is not generally perceived as offering a complete guideline for living as do most religions. However, Atheists frequently derive their own ethics, philosophy of life, and worldview using their Atheism as a starting point. These beliefs are generally derived from secular considerations, and not from any "revealed" religious text. Some Atheists, when asked what their religion is, will answer, simply, "Atheist." Others will say that they "have no religion, they are an Atheist." Still others will use terms like Humanist, Agnostic, Freethinker, religious skeptic, etc. This makes public opinion polls almost useless on this topic. Atheism relates either to a belief in the existence or non-existence of one or more deity, or whether the person associates any meaning to the terms "god" or "deity." Atheism can involve the positive assertion that there is no deity; this is sometimes referred to as "strong Atheism." It is the most common dictionary definition for the term "Atheist," and is probably the definition used by most Christians, other Theists, etc. Atheism can be the absence of a belief that there is a deity. This is the belief promoted by the American Atheists and many individual Atheists. Atheists often promote the belief that archangels, angels, demons, ghosts, etc., are also nonexistent entities, and that they are created by humans. They exist as demons, supernatural entities without most of the powers possessed by the Trinity. The strong Atheist believes that none of the many thousands of Gods and Goddesses exist. Most Christians believe that one god out of the thousands of deities who have been worshipped by humanity exists. Further, most believe that the single Godhead is a Trinity who includes three persons. Whatever the other thousands of deities are, they are not believed to be gods. Although the numerical difference is much less that 0.1%, the philosophical difference is immense. There exists massive discrimination against Atheists in the U.S.
Part of this may be based on the historical linkage between Communism and Atheism. Most Communists are Atheists. But many people do not realize that a large majority of Atheists in North America are not Communists. Another reason for this discrimination is the common belief that a person cannot be motivated to lead a moral life unless they believe in the carrot and stick system: hope for the reward of heaven, and fear the punishment of Hell. In the past, this belief had been codified into law. Conscientious objectors opposed to participating in warfare were thrown in jail if their opposition to killing other humans was not based on belief in God. In the past, many state constitutions specified that candidates for public office must meet certain requirements, including belief in God. Two states still do, although their requirement has no force in law. Still another cause of discrimination is a widespread linkage between theism -- the belief in the existence of at least one god -- American patriotism, and Christianity. The American public exhibits high regards for Buddhists. One reason for this may be that Buddhists have been responsible for very few wars, mass murders, genocides, etc when compared to other major religions. However, a majority of Buddhists are Atheists in that they have no concept of a personal God.